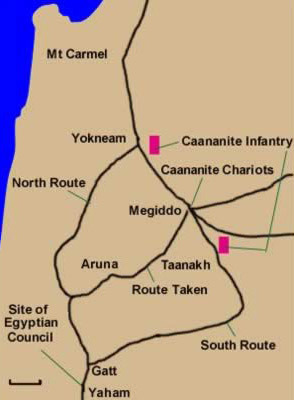 The 15th century BC Battle of Megiddo between Thutmose III and a coalition of Canaanite vassal states. There is debate about the exact year of this battle with 3 common suggestions being 1457, 1479 and 1482 BC. This battle is particularly important as it is considered the first battle to have been recorded with any acceptable level of detail. Our source for this battle, as is often the case, is the victor’s account. Thutmose ordered the war to be recorded and depicted in the Hall of Annals in the Temple of Amun-Re at Karnak, Thebes which illustrate the pharoah’s 14 campaigns in the Levant. This account would have been based on the daily journal kept by Tjaneni, Thutmose’s scribe. Thutmose assembled an army of between 10,000 and 20,000 troops primarily made up of chariots and foot soldiers the Egyptian army marched to Yehem at an average daily pace of 20 km/day. Yehem was a small city located just before a chain of hills west of Megiddo. The King of Kadesh raised an army of between 10,000 and 15,000 Canaanites which he had stationed in Megiddo. Although, apparently safer routes were available to Thutmose, the pharaoh chose the quicker more direct route even though it was deemed more dangerous. Luckily for Thutmose, the King of Kadesh had stationed large forces to protect both of the easier approaches to Megiddo ignoring the route Thutmose had actually chosen. The morning after his arrival Thutmose attacked and routed the Canaanite forces, lack of discipline allowed many of Egypt’s enemies to escape back into the fortified city leading to a prolonged siege, the city was besieged for seven months and the King of Kadesh was able to escape. The Egyptians built a moat and a wooden palisade and eventually forced Megiddo to surrender. The city and citizens were spared. A number of other cities in the Jezreel Valley were conquered and Egyptian authority in the area was restored.